Stripped & Damaged Screw Remover Kit - Great for Drain Screws - Grab-it! Trying to remove a drain cover, but can't because there is a stripped screw or bolt? Our Damaged Screw Remover Kit makes it easy to solve this problem! This 3 piece kit works on broken bolts from as small as No. 10 to as large as 3/8 in. (5mm - 10mm) and can drill up to grade 8 or 10.9 class fasteners. It is industrial strength and is made from high quality tool steel. It is designed to be used in a variable reversible drill but is also effective using a 1/4 inch hex screwdriver and extracts many type fasteners including: Phillips, Slotted, Hex, Torx, Tri-Wing, Pozidriv, Fearson, most tamper resistant screws and many more. This commercial grade product is tempered twice to achieve its professionalstrength hardness resulting in multiple extractions per tool. Removes damaged screw heads and extract free spinning screws. This set extracts screws and bolts for your floor drain cover and other facility applications. Screw remover to be used in a variable speed hand drill set for reverse. Can be used in "quick Change" type chucks for fast, efficient usage. Tool can be compromised if extracting large screws (bolts) exceeding 2 inches in length and/or have aggressive threads. The tool is reusable, simply clean chips off tool and lubricate with oil after use. Be certain the work piece is secure and will not move during the use of this remover. Insert remover directly into drill or quick-change chuck so burnishing end is showing. 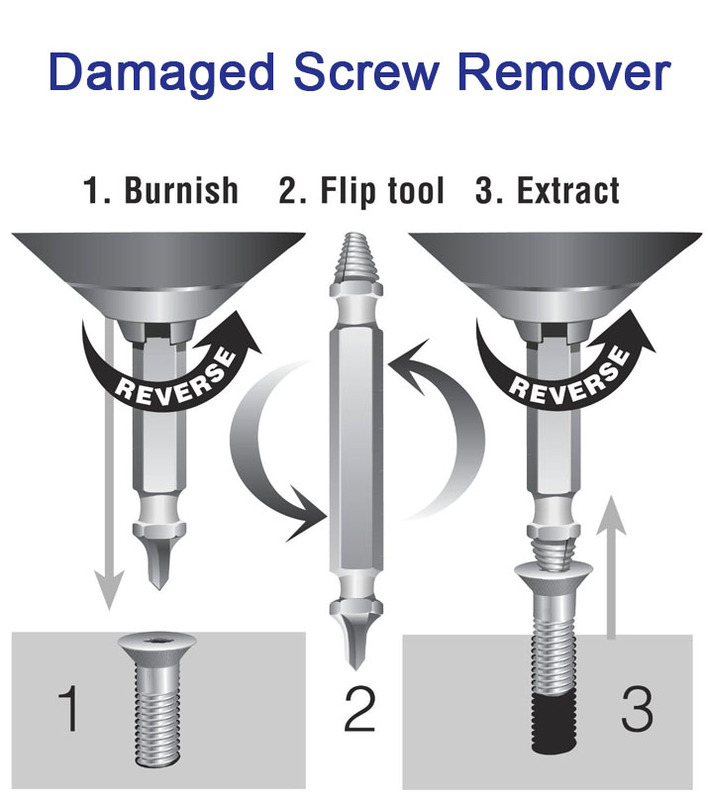 Place burnishing end of tool into the center of the damaged screw (or bolt), and apply power to your hand drill while applying pressure towards the screw. 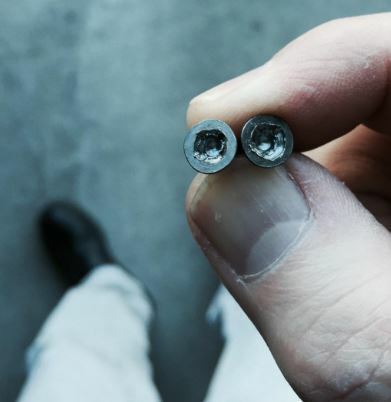 Stop when there is a distinct 1/16" deep clean area in the center of the screw (bolt) head. 2. Remove burnishing end from chuck, flip tool, replace into drill chuck with Remover end now showing. Apply firm downward pressure, drill at slow speed. Apply lowest level of power to the hand drill. Remover end of the tool will thread into screw head and remove. For free spinning screws (bolts), pull drill lightly away from the threads holding the screw (bolts).